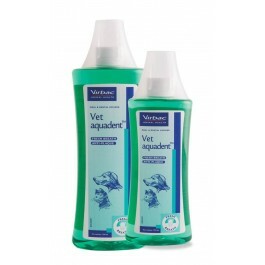 VET AQUADENT®is an easy to use drinking water additive which helps to fight dental plaque and tartar formation. It has been especially formulated by vets for the daily dental and oral hygiene of cats and dogs. Easy to administer - added to drinking water. Dilute Vet Aquadent in your pet's water daily. Use the measuring cup provided to administer the right amount of product. Use 5ml per 500ml of water. Change the water in the bowl every 24 hours, even if all of the water has not been consumed. 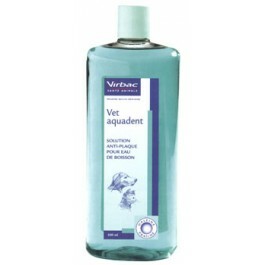 Vet Aquadent is intended for the oral hygiene of dogs and cats with adult teeth, ie over 6 months old. 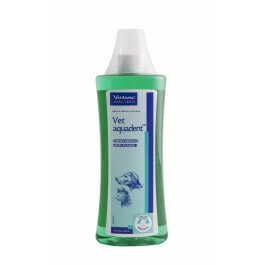 Vet Aquadent can be used in conjunction with a regular dental regime that includes tooth-brushing for best results. Is the xylitol contained in VET AQUADENT® Drinking Water Additive safe for dogs? The toxicity of xylitol to dogs has been well publicised. However, it should be noted that publicity is focused on the dangers of xylitol contained in common human products such as gum, sweets, and sugar replacement products. For example, only one piece of chewing gum can contain as much as 1,000 mg of xylitol. This amount of xylitol may be toxic to a 10 kg dog. Because xylitol is rapidly metabolized, accumulation in the body does not occur from one consumption episode to the next. To illustrate further, that same 10kg dog mentioned in the example above, would need to consume 23 litres of water treated with VET AQUADENT Water Additive in a single drinking session to receive a toxic amount of xylitol. Therefore, pets drinking water treated with VET AQUADENT Water Additive, when used according to label directions, receive levels of xylitol well below that which has been determined to be toxic to dogs. Clarke, David E., BVSc, DAVDC, FAVD, MACVSc; 2006, J Vet Dent, 23(2). Dunayer, EK and Khan, SA, (February 2006), Risk Assessment of Xylitol in Dogs and Cats.